While walking through the park last night I saw a pacifier also known as a Binky, bop, and a bunch of other things.. I paused and wondered about its history. It was laying on a tree trunk and it looked like it had been found and placed there as though the owner would soon return for it. Maybe the finder thought the child’s family would be back in a split second and still be able to make use of it. I’m sure the finder had been through some lost pacifier drama. As a grandfather I know how important “Binky” is. I also know how binkies can disappear into thin air – here one second and gone never to be found again the next. There have been times the family would have paid top dollar to replace one.. Once It took trips to several stores in the late hours to find the kind Baby would accept only to return home and have all the lost binkies suddenly pop out of their hiding places. But back to the binky in the park. How did it get here? Did it belong to a toddler who dropped it and the parents had others that they immediately put to use?. Did the child lose the bop on a peaceful family stroll though the park but once it was lost all hell broke loose? Did the family take the child to the park intentionally to say goodbye to Mr. Bop and a small ceremony was held as the peacemaker was placed on the tree trunk and the child bravely walked away? A big boy or big girl now. 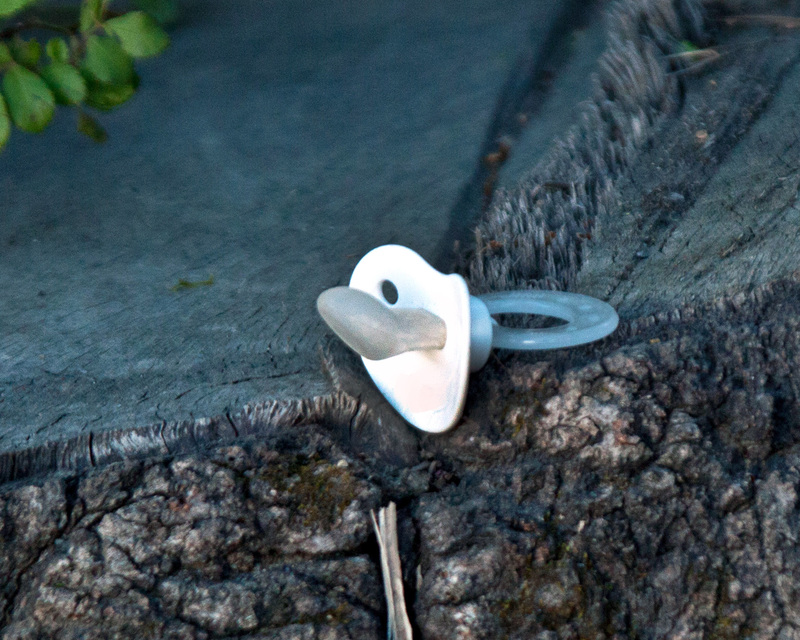 Did the pacifier work as hard as it could to soothe some child unsuccessfully and decide on its own to disappear and felt the park was the place to do it? Who was the child? Was the cutie pie 6 months old? One year old? Two? Was he or she an all day user or just casual? What race? Nationality? A walker or a crawler? Quiet or loud? Really active or really laid back? Spoiled rotten or the sweetest most well behaved baby in the world? How it got here and who the owner was are not to be known but this fantastic piece of rubber and plastic, Mr. Binky, can rest in peace now and should be thanked on behalf of the child, the parents, and the public for the wonderful service provided. It did look peaceful.